Alienware X51 (1.032TB, Intel Core i3-4150., 3GHz, 8GB) PC Desktop. Condition is Used. Shipped with USPS Priority Mail. Includes the power cord. Fantastic Gaming Computer! Was my husbands, but he said it's too much for him and he'd like a laptop. There are no scratches on the unit. The white mark on the front is the plastic that is still on the unit. Hard drive size2TB 7200 RPM HDD 256GB SSD. VideoNVIDIA GeForce GTX 1070 with 8GB GDDR5. This warranty covers the unit for any manufacturer defects. Warranty & Support. WE ARE NOT ABLE TO STOP AN ORDER ONCE IT'S PLACED! Refurbished Alienware Aurora R7, with Windows 10. Dell Outlet Alienware Aurora R7. Video NVIDIA GeForce GTX 1060 6GB GDDR5. Network Interface Card Killer 1535 802.11ac 2x2 WiFi and Bluetooth 4.1. (1x) SPDIF Digital Output (Coax) | 2. Product X51. Make Alienware. Used, tested Desktop PC. The original GPU (1GB GDDR5 NVIDIA Ge Force GT 640) has been replaced with AMD Radeon R5 235 1GB. The disk drive button does not work. Otherwise, fully functional device. Alienware Aurora R7 Gaming PC. 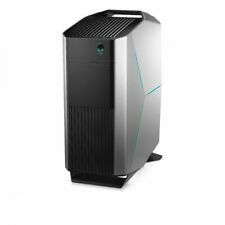 PC Type Alienware Aurora R7 Gaming PC UK Spec. 8GB GDDR5X NVIDIA GeForce GTX 1070 Graphics. Graphic Card 8GB GDDR5X NVIDIA GeForce GTX 1070 Graphics. Evolved, inside and out. In Good condition, unboxed, with 1 Mouse and Keyboard, power cable and hdmi lead, fully tested and reset. Get into that intense gaming session with the NVIDIA GeForce GTX 1070 graphics. A PC with great spec needs to stay cool. The Aurora R7 has optimal air intake from the front and right panels to help maximise the airflow and keep all the components inside the case cool. Here for sale is a powerful Alienware X51 R2 which was originally bought for around £1,000. ALIENWARE X51 R2. Alienware Command Centre 4.0; AlienFX customisable lighting. 16GB 1600MHz DDR3 RAM. SPDIF TOSlink RCA Digital, RJ45 Gigabit Ethernet Network and HDMi rear outputs.